You are here: Home / Monthly Challenge / How Is High Blood Pressure Connected to Weight Loss? More than 60-percent of U.S. adults are considered overweight. Vanity aside, carrying around a few extra pounds can have a huge impact on your health and quality of life. What’s more, among the dozens of diseases impacted by obesity – diabetes, heart disease, cancer, infections, infertility, ulcers and chronic pain – high blood pressure is considered the number one disease related to your weight. This is important because, high blood pressure is currently listed as the primary cause of death among those older than 25 due to its intimate link with heart disease. Heart disease is a huge killer. If you are concerned about women’s health, you’ll want to know about high blood pressure as a risk factor. With each stage comes increased chance for developing heart disease and other cardiovascular related diseases including stroke. High blood pressure can also result in sudden death in some cases. It’s a serious matter and you definitely want to get it checked regularly. As mentioned before, high blood pressure and your weight are intimately linked. Almost half of those with high blood pressure have the condition due to excess weight. This is because obesity causes a buildup of fatty tissue which places extra resistance against blood vessels. This makes it more difficult for the heart to pump blood which, in turn, leads to hypertension. When it comes to blood pressure and weight loss, losing a small amount of weight pays off. Losing as little as 10 lbs can lower your blood pressure by nearly 2 points. Significant weight loss – anything over 10-percent of your body weight – can have dramatic effects on blood pressure as it can lower blood pressure by nearly 5 points. The more you lose, the more the numbers on the blood pressure monitor drop. The apparent link between blood pressure and the number on the scale is why weight loss is considered a primary treatment for high blood pressure. Many physicians will start their patients on a weight loss regiment at the first sign of prehypertension as a way to avoid high blood pressure medications. Of course, blood pressure measurements that fall in dangerous ranges are always treated with medications. Even when this is the case, weight loss still plays a primary role in the treatment and management of the disease. While weight loss can lower your blood pressure, losing weight and maintaining a healthy body weight before high blood pressure occurs can prevent it. Weight loss can also reduce your risk for a host of other diseases, most of which are among the leading causes of death in America. 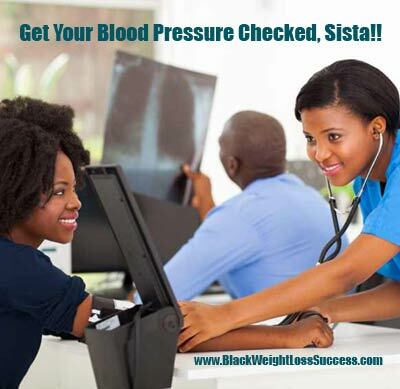 We talk about high blood pressure a lot in the black community and many of our friends and family members are dealing with this health issue. Get your blood pressure checked and do you you have to do to bring it down if it is too high. Your health is worth it. Have you had these 6 Essential Health Tests? How Is Your Weight and Heart Disease Connected? This is so true! I’d lost 20+ and I’ve been off my mediation for over a year! Weight loss is a great way to deal with hypertension! Tell me what things you did to make the food transition easier.